We are seeing a lot of significant damage to leaded stained glass windows from the improper installation of protective or insulating glazing. If you have a layer of any material over your stained glass windows for the purpose of protection or insulation, we advise you to evaluate it immediately. Windows with no other structural or maintenance problem are buckling, breaking, corroding and collapsing because of unrelieved pressure and moisture trapped between unvented layers. This damage can also extend to the supporting frames and surrounding architectural elements. If this faulty double glazing is not corrected, your stained glass windows risk being destroyed by the very thing intended to protect them. We are finding so much double glazing that was installed incorrectly that chances are high, if you have double glazing over your stained glass, it is causing more problems than it is preventing. Most faulty installations are based on the incorrect assumption that the space between the window and the protective or insulating layer must be sealed airtight in order to be effective. This is simple not necessary, not even to achieve good insulation. An examination of the best systems of residential storm windows and frames will show they are constructed with various weep holes, drain channels and unsealed frames. These air and water escape ports, or vents, prevent the entrapment of dangerous moisture and heat. Each panel of stained glass covered by a protective or insulating layer of material must be ventilated enough to allow a full exchange of air between layers several times a day. We have found the most common problem from unvented double glazing to be excessive heat buildup between layers. This heat has two damaging effects. First, trapped air and moisture expand and create a large amount of pressure that pushes sideways on the flexible leaded glass window. This is like using the stained glass as a lid on a pressure cooker. 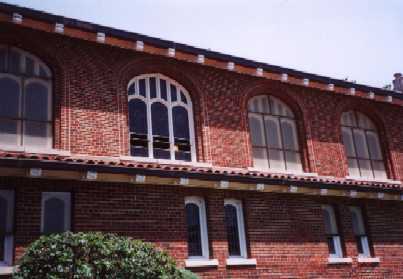 The expanded air forces the stained glass to bend which can be seen as bows and bulges in the window. The window is actually trying to move away from the covering layer to allow more room for the trapped air. The second effect of superheated trapped air is that it magnifies the degree of harmful expansion and contraction caused by extreme heating and cooling of the stained glass. The bowing and continual flexing of the window damages it by weakening the lead channels, breaking solder joints, breaking the glass and tearing the window away from its support and reinforcement systems. It can also cause leaking and drafts from loss of cement and loosening of putty around window edges. What about the bulging and sagging windows that have sections in them that are bowed towards the outside as well as in? Regardless of whether the panels sag in or out, the cause is usually the same excessive heat. The inward thrust of some panels away from the double glazing pulls the panels above and below them out of vertical alignment in the opposite direction. This collapse gives the window a very unattractive wavy or rolling appearance and substantially weakens the window. Due to the high expansion rate of the plastic commonly used in the past for double glazing, trapped heat also causes problems to the protective layer. As the plastic panels expand, they may literally tear their frames apart or they may bow in against and press on the stained glass it is supposed to be protecting. Trapped moisture is another major problem that results from completely sealing the space between the stained glas and the double layer of protective glazing. This water is a terrible enemy of a leaded glass window. Normal humidity and rain are not harmful to a stained glass window. A wet condition that will cause a problem is rearely found in an uncovered window that has been well made, properly installed and maintained. However, a dangerously wet situation is frequent in windows whose protective or insulating layer is not adequately vented. This situation occurs even when trapped moisture cannot be seen or when steps may have been taken to keep moisture from being trapped. We also believe that exposure to other current atmospheric conditions, including air pollution, does not require any kind of double glazing. Constant moisture, such as that from condensation, and sulfuric acid, which forms when pollution is trapped with water or water vapor, will etch and pit glass, remove painted details fired on glass, promote the corrosion of lead channels and steel frames, rot wood window frames, draw mortar from stone frames and, generally, work to deteriorate the entire window. We believe a regular circulation of air across an uncovered stained glass window will adequately protect a window in good condition from the harmful effects of both water and air pollution. CAN DOUBLE GLAZING BE USED IN PLACE OF REPAIRING STAINED GLASS? A leaded stained glass window in good condition will be airtight and leak proof. It will also have certain characteristics about it that permit it to help preserve itself in normal weather and other environmental conditions. Even without double glazing, a stained glass window in good condition should not leak or be drafty or decompose. If a window is already doing any of these things, double glazing it will not repair it and will not reduce further deterioration. IS THERE EVER A GOOD REASON TO USE DOUBLE GLAZING? The most valid reason to have double glazing is to protect your valuable stained glass from VANDALISM. However, when protective glazing must be used, adequate venting is essential. If you do not currently have double glazing on your windows and do not feel the need to protect your windows from vandals, you can probably do without it. If you have double glazing on your stained glass and feel that it must remain for protection, exmine your stained glass windows and the double glazing layer now to determine whether or not proper venting exists. Do the same inspection and evaluation if you choose to keep any existing double glazing for a measure of extra insulation. 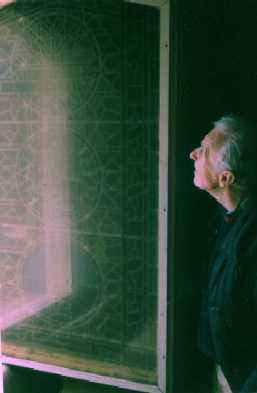 Bernie Wixon examines a so-called layer of protective glazing that has actually bulged against the stained glass causing it to collapse.Bernie Wixon is shown examining a stained glass window that is on the verge of disaster because of the improper design and installation of its double glazing. Many of the mistakes made here and the problems that are being caused are common for windows we are asked to repair. These include the following. A thick plastic sheet that always clouds and discolors has been used as double glazing material in a location where is was not necessary to protect the window from vandalism. As can be seen in the picture, the panel has already started to discolor and become opaque. The plastic has been retrofitted directly into the original wood frame with no provision made for the large coefficient of expansion and contraction of this material. In this case, because the frame is still strong it has been able to resist the force of the expanding panel. Unfortunately, the expanding panel had to go somewhere and it has flexed into the adjacent stained glass window. It has caused significant damage to the window it was intended to protect. If you are unsure of how to evaluate the present condition of our stained glass windows and window system, we would be glad to assist you. If a situation is found that calls for some corrective action, there are several options that can be considered. We would be glad to explain these to you. Some of these actions are easy and inexpensive to make. All are cheaper in the long run than sacrificing your windows. If repairs or the need for regular maintenance exists, we can also do this for you.